You are here: Home / Review / COMET & CHARGE! September Giveaway! They’re BACKKKKKKK!!! The COMET TV along with CHARGE TV giveaways are BACK!!! You can’t forget the action network CHARGE! There is a Rocky marathon featuring the classic film series all month long! CHARGE! is an action network showing the most “kickin’” and “punchin’” films ever created. COMET TV and CHARGE! are giving you the opportunity to have an awesome September of your own! The COMET TV and CHARGE! 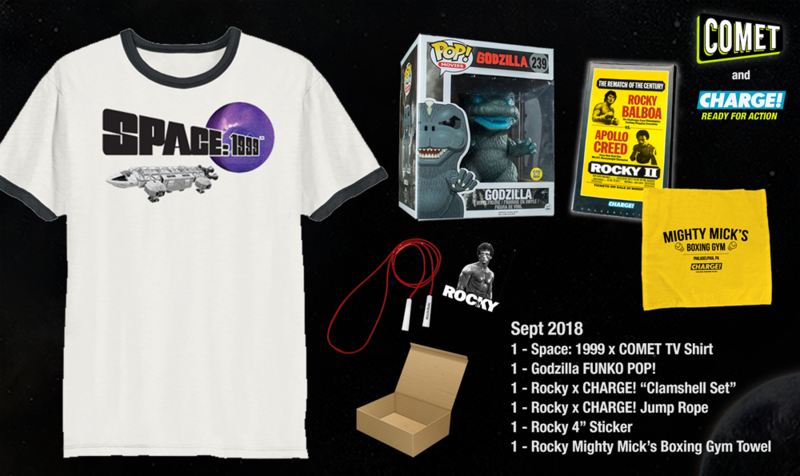 September Prize Pack is perfect for binging some classic films and TV Shows! My favorite Sci-Fi television series is the original Star Trek. My favorite episode was The Trouble with Tribbles. My favorite is the Back To The Future series. They have so many hidden and subtle things that you see a new one every time you watch it. My favorite is The Twilight Zone. Old school mysterious fun. I am a fan of spoofy zombie movies. Funny ones. The James Bond film series is definitely a favorite action movie series! I loved the old 60”s Japanese sci-fi shows Ultraman, Space Giants,and Johnny Sokko. I used to love Babylon 5…what a great show that was! This is the best thing we can get. Congratulations to ME!! It's A GIRL!! !